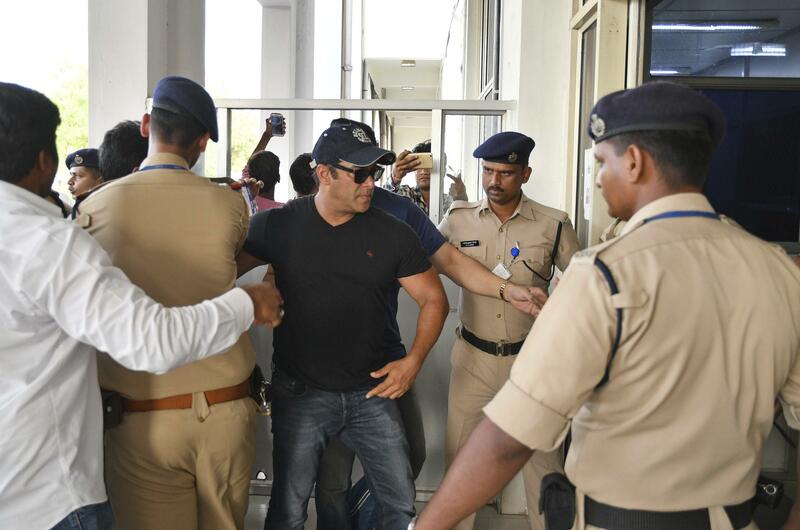 Sat., April 7, 2018, 9:45 a.m.
NEW DELHI – A court on Saturday granted bail to Bollywood superstar Salman Khan, who will be allowed to remain free while he appeals his conviction on charges of poaching rare deer in a wildlife preserve two decades ago. Khan was convicted on Thursday and sentenced to five years in prison, and was immediately sent to jail. On Saturday, Judge Ravindra Kumar Joshi ordered him to sign a surety bond of $770 before he could be set free from the jail in Jodhpur, a town in western India. After he was released, he was driven straight to the airport to fly to his home in Mumbai, India’s entertainment capital. Khan’s overjoyed fans danced outside the courtroom and chanted “We love you, Salman.” His sisters, Alvira and Arpita, were present during the hearing. Four other Bollywood stars also accused in the case – Saif Ali Khan, Sonali Bendre, Tabu and Neelam – were acquitted Thursday by Chief Judicial Magistrate Dev Kumar Khatri. They were in the jeep that Salman Khan was believed to be driving during the hunt in 1998. Soli Sorabjee, a legal expert, said it was normal for bail to be granted in such a case, and didn’t see Khan getting any special treatment from the court. “This has nothing to do with Khan’s personality as an actor,” he said. The 52-year-old Khan has starred in more than 90 Hindi-language films. But he has also had a reputation as a Bollywood bad boy, known for his run-ins with the law – including a fatal car accident – and his troubled relationships with women. Published: April 7, 2018, 9:45 a.m.